Average rate of change: (slope) NOT constant. This function is the positive square root only. 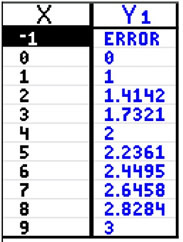 Remember: The square root of a negative number is imaginary. If we solve y = x² for x: , we get the inverse. 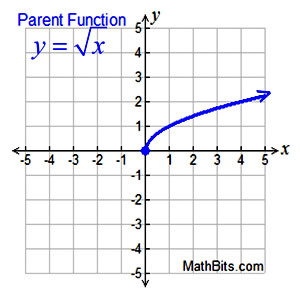 We can see that the square root function is "part" of the inverse of y = x². Keep in mind that the square root function only utilizes the positive square root. If both positive and negative square root values were used, it would not be a function. Unlike the square root function, the cube root function can process negative values. , we get the inverse. We can see that the cube root function is the inverse of y = x³.